Callie Daniels' mother has one dying wish. She wants neighboring rancher, Garrett O'Neill, to marry her seventeen year old daughter. It's not supposed to be a conventional marriage. Garrett O'Neill would keep Callie's ranch safe and Callie would go away to college. Callie finally gets her heart's desire. Alone in a line shack, they make sweet love for the first time. Unfortunately the love light is gone from Garret's eyes the next morning. Callie's heart is the most open and most giving. Kathleen Ball created a character that's impossible to dislike. From the moment I met Callie in Callie's Heart, book 1 in The Lasso Springs Series, I knew I'd be rooting for her. I cried for her sincerity in seemingly impossible situations. Not only did she have to deal with the darkest of doubts in her marriage, she had to deal with hard ranching and finding a place to call home. I admire Kathleen's writing because she doesn't give her characters the easy way out. She makes them face their fears and talk out their differences. Garrett and Callie's relationship was not always ice cream, smooth and sweet, but full of heartache and anger. 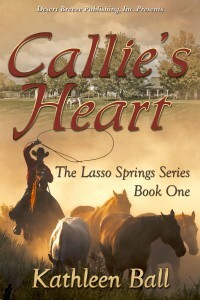 Callie's Heart is not just a romance, but filled with ranching cowboys, mobs, and mayhem. I was surprised at how many turns the story took. The story moves at a medium fast pace, fast enough to feel like the story is going somewhere, but slow enough to really get to know the characters. Garrett and Callie were my favorite characters. It seemed like they were always misunderstanding each other, pulling apart to only come back together again. I wouldn't say the story's ending was inevitable, because so many things could have gone wrong for the ranchers, but I'm wholly satisfied.